The RS485 surge protector is connected to the RS485 cable of SolarEdge HD inverters. The ethernet surge protector reduces faults in SolarEdge HD Wave inverters caused by electrical surges on the RS485 cabling. Electrical surges can occur on the AC, DC and communication cabling connected to the inverter or DC optimisers. Failures on the grid such as trees falling onto power lines etc. Surges from lightning are not simply from direct lightning strikes; lightning in the vicinity can cause surges or even lightning strikes on the power or telecommunications lines many kilometres away, can cause a surge on the solar systems cabling. The RS485 surge protector is not designed to protect against a direct lightning strike, but rather large electrical surges resulting from lightning strikes occurring within the vicinity. The RS485 surge protector is designed to divert electrical surges to ground when a surge is detected on the circuit. 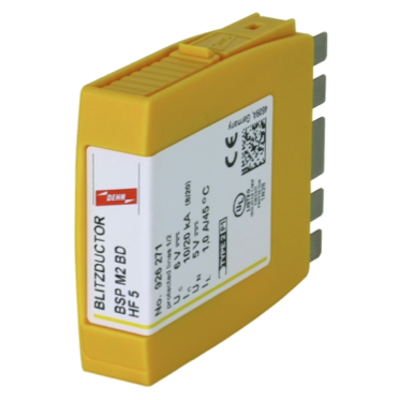 The RS485 surge protector is designed for DIN rail mounting and can be pre-installed in the solar distribution board or be placed in line with the RS485 cable. It is highly recommended to install appropriate surge protection for all PV system installations and failure to have sufficient protection can affect warranty claims or put the system at risk of irreparable damage.